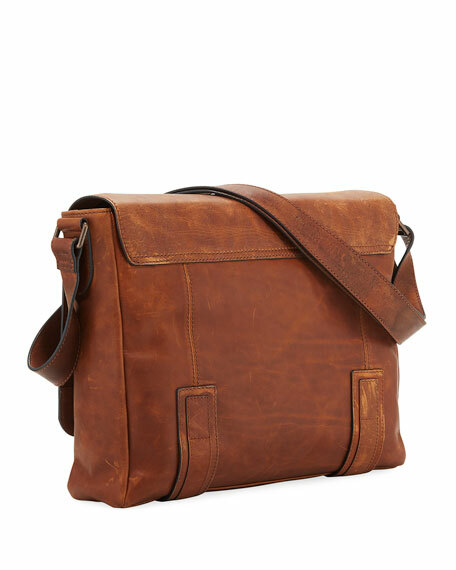 This Frye messenger bag opts for a rugged, masculine look over sleek modernism. 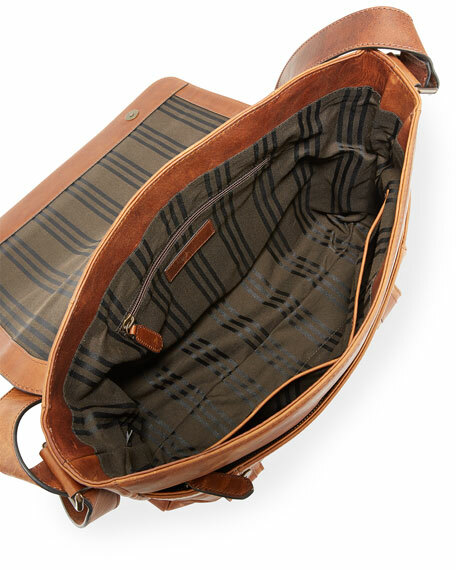 Whether you're going across town or across the country, its classic construction makes it an ideal traveling companion. Oiled leather with antiqued golden hardware. Adjustable crossbody strap; 17" drop; dangling Frye logo tag. Flap top with snap closure; zip pocket under flap. Signature striped jacquard lining; one zip and two open pockets. 10"H x 15"W x 4"D; bag weight: 3lbs. Bally calf leather belt bag with silvertone hardware. Adjustable Web belt strap. Zip top closure. Interior, fabric lining. "Break 70"
Bally calf leather belt bag with silvertone hardware. Adjustable Web belt strap. Zip top closure. Interior, fabric lining. "Break 70" is made in Italy. Bally crossbody bag in calf leather with golden hardware. Adjustable crossbody strap featuring iconic logo print. Buckle flap closure. Logo-embossed tag. "Cage" is made in Italy. Bally crossbody bag in solid nylon. Gunmetal hardware and leather trim. Logo-print removable, adjustable shoulder strap. Logo-embossed key fob. Front zip pocket. Zip-around top closure. 9.1"H x 6.7"W x 4.3"D. "Triller 0" is imported.